If there’s an air of superiority to these units, it’s because they’re the quietest, most efficient models Carrier makes. 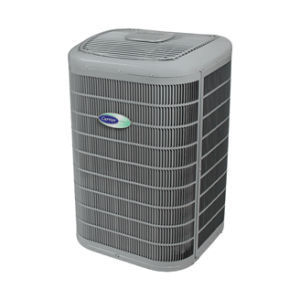 Built for total home comfort, the Infinity series central air conditioners offer an enviable SEER rating of up to 21. Combine it with Carrier’s innovative Infinity® control for the highest degree of comfort management. Looking for the most economical way to improve the reliability and efficiency of your central air conditioning system? Turn to Carrier’s Comfort series. With impressive SEER efficiency ratings ranging up to 16.5, they’re likely to cut your utility bills. And because these models can run even quieter than a common hair dryer, it’s easier on your ears as well.